I did not want to like OrangeTheory Fitness. On a brief visit home to Tallahassee where my ClassPass membership is meaningless, I decided to give it a try for the sake of the blog. The reason I didn’t want to like it is that it’s a chain, a nationwide franchise, and in Tallahassee they’re located right across the street from one of my favorite locally-owned studios, Sweat Therapy. But my body hasn’t felt this way in a while. Totally spent. Like I really pushed myself to places I didn’t think I could go. The set up is a lot like Barry’s Bootcamp, but they also have rowing machines, and the most important feature, you wear a hear rate monitor. I’ve seen these at BFX, and even wore one at Drill Fitness, but this was the first time I was sold on their true value. In the past, at Barry’s I’ve been hesitant to try the big numbers the teacher calls out, convinced that my body can’t handle them and I might go flying off the machine. I’m a max-out-at-6.0mph kinda girl. Or I used to be. Tomorrow will be day 50 of my 100 days, and despite my body shape (or at least my body image) not changing a whole lot, I’m definitley MUCH more fit than when I started. Feeling strong is the best high. Wearing the heart rate monitor today helped me realize how strong I am. 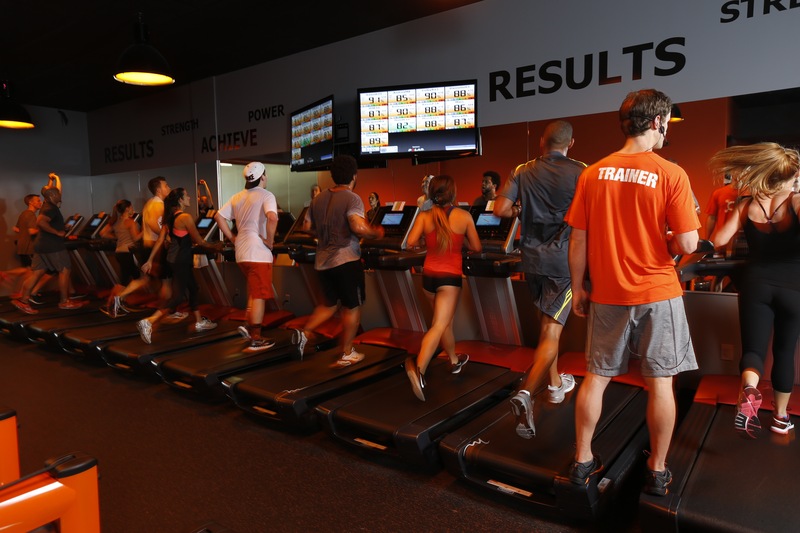 At OrangeTheory Fitness (soon to open a Chelsea studio in NYC), like at Barry’s, you move from intervals on the treadmill to strength training floor work. Unlike at Barry’s, the workouts are a little more varied (sometimes you’ll only be on the treadmill for 5-minute stints, and other times for longer). Also, your name is on the big screen with a bunch of numbers, the most prominent of which is your heart rate. It’s highlighted in a color that corresponds to your ideal and maximum heart rates (which are calculated based on your gender, age, and weight). I can’t remember the exact breakdowns they tell you are ideal, and I liked the fact that the teacher told us to just ignore them if they were distracting us. The idea is to be in the Green zone (fat-burning) for part of the time and in the Orange zone (84% or higher of your max heart rate) for part of the time. According to the people at OrangeTheory, by getting that time in the Orange zone you will experience Excess Post-Exercise Oxygen Consumption or EPOC. This means you’ll have an increased metabolic rate even after you stop working out. I’m looking forward to that, and can actually feel it. Even more importantly though, looking at my heart rate numbers taught me more about myself. I actually had to go a lot faster than I thought I could to get to the orange zone, like 8.0-8.2 without an incline. I also learned that inclines are the killers for me. I had to slow way down when the incline was 5.0 or higher. Plus, I saw that I had a pretty quick recovery rate and my starting heart rate was pretty low which means I’m fit! This kind of workout also means you CANNOT CHEAT or fake it! Which I’m often tempted to do in spinning class. Sigh. It means that even as I get fit, I can keep my workout challenging by pushing myself to the zone every time. So, as much as I hate the idea of a franchise beating out the local guy, this was a fantastic workout. Now, let’s see if they’ll be on ClassPass once they open in NYC! 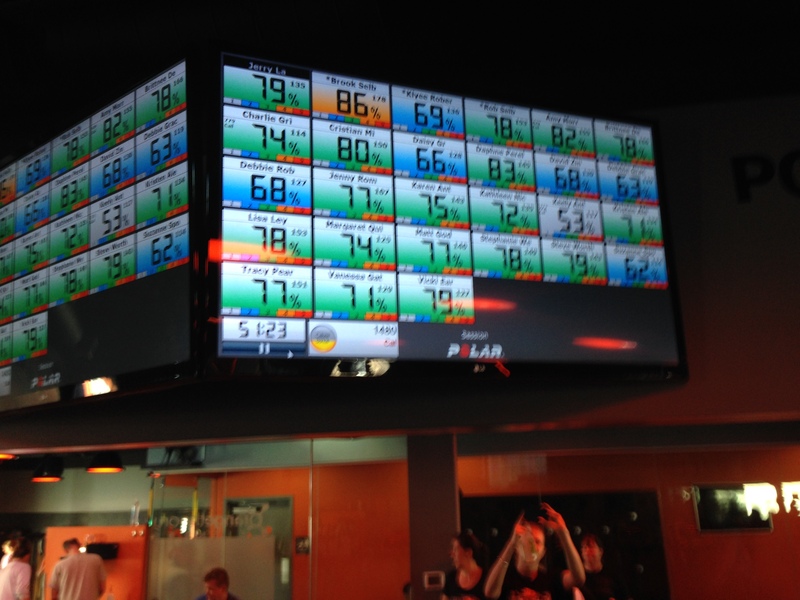 Heart rate tracked by monitors shown on a video screen; progress tracked and sent to you via e-mail; clean space; efficient total-body workout; great instructors and class sizes small enough for them to help you with your form. Not as many amemities as at some studios I’ve seen– the location I went to had limited locker/cubby space and only two showers; pricey. I recently tried OrangeTheory and LOVED it!! The one here was on ClassPass for literally a day but they are too popular without CP to be able to open any spots up for CP people. It’s the kind of place where I wouldn’t mind buying a class every now and then just bc of how great the workout was!